Lice Happens ™ in-home head lice removal service is now available in the Raleigh-Durham/Chapel Hill, North Carolina area to eliminate head lice and educate families. Head lice can be very disruptive to families, especially given the vast amount of misinformation out there on effective treatment methods. Filling an urgent need, Lice Happens is thrilled to announce it is expanding its team of professional head lice treatment specialists to provide convenient, effective, and discrete mobile head lice removal services to families in the Raleigh-Durham/Chapel Hill area. Lice Happens offers confidential in-home head lice screening and treatment services using all-natural, pesticide-free products, while empowering parents through education and hands-on training, all in a single visit. Calling Lice Happens local 24-Hour LiceLine at 919-609-2046, connects you to a lice treatment specialist equipped with the knowledge to answer questions and mitigate the fear and anxiety commonly associated with head lice. A certified lice treatment specialist will be dispatched to your home to provide safe, gentle, and thorough service that eliminates head lice and nits (the tiny louse eggs that are often easily overlooked). Specialists work quickly and effectively to remove lice and nits while educating families and providing information to prevent re-infestations. 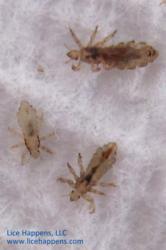 Lice Happens can also be reached via email at info@licehappens.com. Lice Happens is a nationwide company founded by two Annapolis, Maryland residents: Mary Jane Eckert, a Registered Nurse, and Nancy Fields, a quality assurance professional. Both Eckert and Fields, along with their certified lice treatment specialists, serve as subject matter experts working to debunk the many falsehoods about head lice as they work to help families through what can often be a very stressful time in their lives. “We are delighted to offer our highly trained lice treatment specialists to serve families in the Raleigh-Durham/Chapel Hill area,” says co-owner MJ Eckert. “Head lice can be very disruptive to families, especially given the vast amount of misinformation out there on effective treatment methods, and we look forward to educating families as we provide our highly effective services,” adds co-owner Nancy Fields.